Why hello there! Do you blog? You do!? Does your blog have super cool Middlehammer content? It does! Well, why not register your interest in getting involved in the exciting new Middlehammer Blog Hub! There are plans afoot, to host news about events, painting themes and challenges (more on that later tonight and tomorrow! ), and showcase the highlights of the Middlehammer content from the registered blogs. All you need to do is post a reply below with a link to your blog and I'll add you to the list of interested parties and then I'll be in touch in due course. 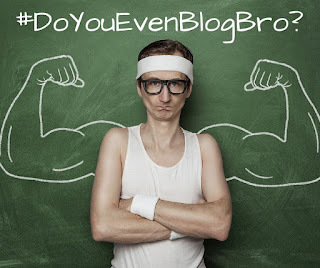 If you don't blog, but you LOVE Middlehammer, have you thought about starting one? 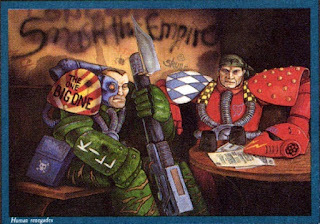 To celebrate the 30th Anniversary and recent re-release of Warhammer 40,000: Rogue Trader (well played GW, well played!) the Middlehammer group is running a competition for one lucky member to win a custom Strike Force of Rogue Trader inspired miniatures, with a Middlehammer twist! How do you enter? Simples - you have to contribute one of the models for the Strike force, painted, and if desired converted, complete with a short back story and WH40K Stat line. UPDATE - the group has gone for Blue-Grey as the main colour (e.g a mid grey like Space Wold Grey or Shadow Grey etc.) and Bright Orange as the secondary colour. Colours/finishes of armour, weapons, skin colour, straps, gear and so on are all up to the individual painter to select. The 2014 Oldhammer Legacy Warband group decided upon a multi-racial 'Good Aligned' warband, with Olive Green and Bone as the primary and secondary colours. You can check out their results here to see what I mean. They've been running every year since and I encourage you to check out the Legacy Project 2015: Space Pirate Crew - , the Oldhammer Legacy Project 2016: C49 Chaos Villagers was pure (evil) genius! They are running a Legacy project again this year on the Oldhammer Forum if anyone is interested. All participants agree to paint and contribute one model to the pre-agreed theme (to be decided on the Middlehammer facebook page). You paint the model and post it to your friendly neighbourhood organiser (me - StuntCat). All contributors are entered into a draw, and the winner out of the hat wins the whole Strikeforce for their collection! Anything that you think fits with the theme to be agreed on the Middlehammer fb group. 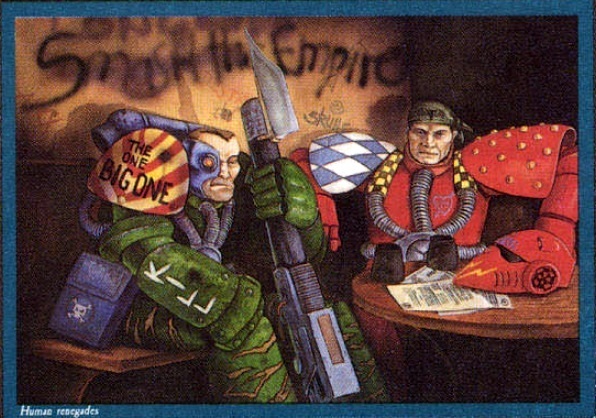 The core premise is that it is inspired by the Rogue Trader Universe so I'm guessing that many will go for something Middlehammer in period but themed towards RT somehow. The model could be a straight up RT era classic if you want, but it certainly doesnt have to be. It doesn't even have to be Games Workshop really, if you have something from another range or manufacturer then all good as long as you can make it fit the theme. Conversions are welcome, but again, not essential. If people want to branch out into robots, companion animals, or small vehicles, then that is all good too. How will this Strikeforce look coherent? Firstly, the colour scheme will be decided along with the broad theme, via the Middlehammer Facebook group by the people participating. Secondly, and again taking our lead from those who have gone before us, the winner does the basing for the warband. This will ensure that a) the Strikeforce is coherently based and b) the Strikeforce fits into their own collection. 1.Participants need to register what model they will be contributing via the Middlehammer page as above. This post will be updated with details as we go along. 2. Completed models, with a plain black round base of appropriate size, need to be sent to me at the participants expense, and received by Friday 31st March 2017 (postal address to be supplied privately to participants). 3. Each model to be accompanied by a name, short back story (200 words max), and a Rogue Trader stat line (via email or facebook message). 4. The draw will take place during the first week of April. 5. The winner will be announced here and on the Middlehammer facebook group in the first week of April. I will send the completed strikeforce to the winner via recorded delivery, hopefully to arrive by Easter 2017. 7. It would be great if the winner would also be up for writing a blog post for the new Middlehammer Blog Hub to go with said pictures and cheesy grin, but not if they really don't want to. So, it's that time of year again and the blogosphere is filling up with yearly round ups and hobby resolutions. Yes, it's cliche but I find it a useful exercise, and I've surprised myself at how much I have actually produced in 2016 - although no where near the consistent standard of many Oldhammer luminaries. I've followed the lead of some other bloggers and my 2016 round up focuses on those minis that did not get featured in a blog post - mostly for two reasons a) the standard is table top ready at best and/or b) they are intended for my D&D campaign, so I tend not to show them on line before they have actually debuted in our campaign and we only play once a month so that can take a little while. 1. Finish painting my Caledor themed High Elf army. Well, this was to be my major project this year and it got no where near the attention it required. I certainly didn't finish painting them all, and I may even have made an additional purchase in the shape of a very badly treated Prince Imrik on Dragon which will probably take years before it sees the light of day. I did however make some progress, adding a couple of basic troop units, a couple of bolt throwers, a fair sized unit of Silver Helms, and a couple of extra character models. More importantly, I managed to play a couple more games of WFB4 with the ones I had painted - and this actually contributed to why more elves were not finished, because I felt the need to work on my Greenskin army in parallel, adding two units of Goblin archers and a few more lines of assorted Orc infantry along with the Goblin Doom Diver and Wolf Riders already shown on this blog. Given my other projects I'm going to be more realistic, but am determined to keep up momentum with both WFB armies, so my 2017 ambition is going to be to add at least 2000 points spread across both armies by the end of the year. The forces of Caledor - I have about the same again, plus more cavalry, still waiting to be painted. Da Greenskin Horde - loads more in the lead pile to add to this mob, including some chariots if I muster the gumption. 2. Start work on my Rogue Quest project. This has definitely been my most successful ambition. Four out of six embers of the party finished and blog posts published, a couple of spin off projects thrown into the mix and a couple more lined up before the end, the next member of the party on the table and already base coated, the final member finally acquired after more than 12 months of searching! It also spurred me on to bash out a few gangers that had been hanging around since before my 2015 painting revival. For 2017 this ambition becomes Finish the main Rogue Quest Project and any associated side projects currently planned. 3. Improve my basing technique. OK, so as predicted I'm still working to complete existing forces so I still paint my bases a fair amount of the time, and use basic sand flocking or poorly textured putty most of the rest of the time, but at least these days I use putty to fill in the gaps, and the painted bases have got a bit better (in some cases). There are however some genuine signs of improvement. I've taken to using lentils or small balls of putty or dried lentils to represent toadstools, and small stones as boulders etc. Really basic stuff, but it does make a difference. The Discworld models below are an example of what I mean. I've seen the light with this one and I think it is going to improve naturally from here on, so I don't feel the need for a basing related ambition in 2017. I'm going to set myself a different challenge: Complete an all metal (or primarily metal) conversion. This should involve actually cutting into lead! Drilling and pinning, and filling with green stuff. All things which any hobbyist worth their salt should be proficient in, and which I've never had a huge amount of success with, prior to a half a decent fix on a broken Trolls leg earlier this year. I'm reasonably confident, though not very skilled with converting plastic, but working with metal will be pushing my modelling skills. 4. Collect, convert, and paint my first Frostgrave War band. FAIL! I've certainly managed the collecting part in that I let myself free wheel and buy whatever minis I thought could fit in to any number of FG war bands, but I have not assembled any complete war bands. Now, if only someone was making a similarly diverse kit with fantasy female models, my D&D NPC needs would be so much easier to meet! Rogues (rear view) - loads of great bitz in the FG Soldiers kit! I also cobbled together some basic treasure tokens/scatter terrain for FG/D&D using some crates, chests, and urns from Blacktree Miniatures, and some press moulded quivers of arrows. So it wasn't a complete bust! This ambition stays as it is, with one amendment - NO MORE COLLECTING - the war band has to be assembled from the minis I already own. Apart from the replacement set of FG Soldiers. Obvs. 5. Sell or trade more minis, games, and rule books. FAIL! I've not sold another thing all year. I have drastically reduced my purchasing however, and am making good progress at actually painting things from the lead pile and actually using them in games! I really need to pull my finger out with this one though. Did I mention the 28 KG of superfluous rule books? This ambition stays as it is, but maybe it moves up a few places in importance? So what else did I manage to get painted in 2016? Because I didn't have enough painting deadlines towards the end of the year, I decided to paint some Discworld characters from Micro Art Studio as presents for some members of my family, all of whom are big fans. It was only this year that I was able to bring myself to read his last book before he died, The Shepherd's Crown, and I painted these very shortly after finishing the book. A poignant moment for me. These were finished the day before they were due to be given as gifts - luckily I managed to get some WIP shots, but sadly none of the fully finished versions. More D&D NPCs & Monsters! I've shared lots of my recent work in my post of Mini-collecting driven D&D Campaigning (or vice versa? ), so these pics focus on minis that I have not shown on the blog before (with a couple of reappearances). The minis come from a variety of producers, but many of them current - More from Blacktree, plus some from CP Miniatures, Hasslefree, a couple of Necron Scarabs from GW, a giant centipede floor tile (I can't remember who made this I'm afraid) and a Prince August noble for good measure. I find myself painting a lot of Bards etc. due to the nature of our D&D campaign, and one of my favourite models of the year was this chap, the One Man Band from CP Miniatures 28mm Victoriana range - who has now made his debut as Sparrow the Bard in our campaign, so can be shared here. Shot of some of the extra bits added to the Orc Treasure Hunter - from the FG soldiers kit again! The promise of more HQ and some creative genius from the 4year old mind of Son#1 has also spawned the first side project of the new year, and filled me with so much enthusiasm I rescued a can of spray undercoat from the near freezing garage and now have it inside a sock coming up to room temperature ready for action tomorrow! So what are your hobby related ambitions or resolutions for 2017?